Noku has just launched the latest version of its wallet: the Noku Wallet 2.0, a unique multi-blockchain interface. A powerful interface that allows you to interact with the blockchain while remaining in full control of your keys, your UTC / JSON and your transactions. But also a client-side interface: extremely easy to use and designed to give a satisfying experience while managing your transactions. Let’s find out all the new features of the Noku Wallet. With the Noku Wallet you can choose your wallet name. The name function is supposed to facilitate the managing of your different wallets and to easily identify them once you are in the Noku Workspace (what is a workspace? Be patient, we’ll tell you very soon!). To help you remember you avatar easily, we let you choose it from a wide range of colors combination: so you can pick the one you think you’ll remember better. Once you’ve created your new wallet, you can unlock it in different ways: private key, encrypted key, UTC / JSON file or mnemonic phrase. The last option is the more innovative: it’s designed for all of you who have already created a wallet on another platform and want to migrate it to our interface. With the Noku Wallet, you can anytime see your private key and copy it on your device. When you check your balance, you can also see a clear and instant list of the tokens you own. For both total and token balance, the interface displays the delay: the exact moment of their last update. You can refresh your balance in order to check its real time variations, just after you’ve done a transaction. You can save your wallet, that is generate a UTC / JSON file and keep it safe on your device. And you can always print your wallet on a piece of paper that contains both the private and public key and the related QR codes. To avoid the annoying procedure of always go searching for your addressee’s public key, we’ve added a very practical feature: a rubric, in which you can store the addresses you more often send transactions to. When you start signing a transaction, the Noku Wallet shows the full balance you can use, and when you set the GAS price it displays automatically the fee provided. If you want to send a sum expressed in fiat coin, the wallet will do the exchange automatically using data taken from CryptoCompare: just enter the sum and the interface will report the correspondent value expressed in ethereum or the chosen token. Have you ever dreamed of an accessible transaction history? 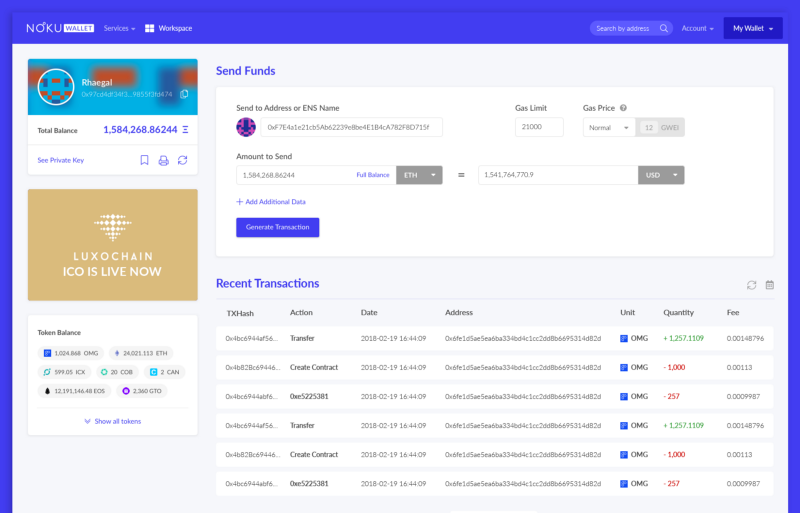 With the Noku Wallet it’s finally possible: in the dedicated section, you can see an overview of the transactions already signed. For every transaction, you can check the TXHash, action, date, addressee, amount of coin transferred and fee; plus, clicking on an address you can scan its profile. In order to fight against phishing and guarantee that you won’t ever be scammed, we put certified banners for each ICO we promote: clicking on the banner, the Noku Wallet will automatically set all the parameters for a transparent and safe transaction.